In this post I am going to be taking a look at 6 ways organisations are already integrating learning into their workflow systems – so that the same social tools are being used for both working and learning. But first of all, let me explain the diagram below, which visually summarises this post. We learn every day, in everything we do whether it is in what we read, watch or listen to (CONTENT/information ), in the conversations and discussions we have with others (PEOPLE/interaction), as well as in formal learning settings e.g. in a school classroom or training session (INSTRUCTION:CONTENT+PEOPLE). In the Workplace we learn from both external as well as internal sources. 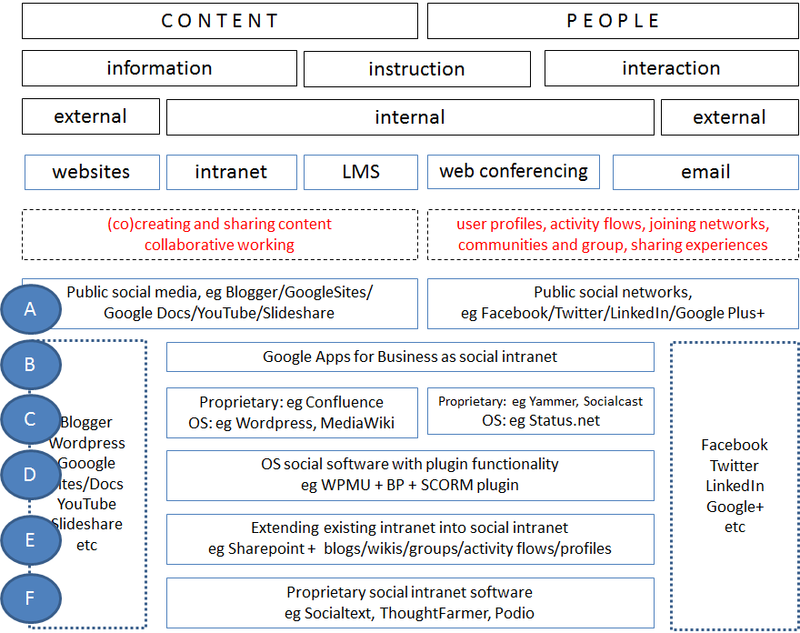 Use of social media (externally) for the (co)-creation and sharing of CONTENT/information and collaboration, as well as the building of trusted networks of friends and colleagues for PEOPLE/interaction is now impacting the way we both work and learn within organisations, and means that existing internal systems (intranet, LMS and email) are being surpassed by new social and collaboration tools with more appropriate functionality for today’s world. As a consequence of this we are also seeing the convergence of working and learning. Some organisations prefer to host their own software themselves (either internally or “in the cloud”), and have installed open source software to provide private content creation, sharing and networking functionality for their workplaces – and hence have created an additional “social layer” in their organisation. This includes tools like WordPress.org for multi-user blogging, MediaWiki for wikis, as well as networking tools like Status.net. 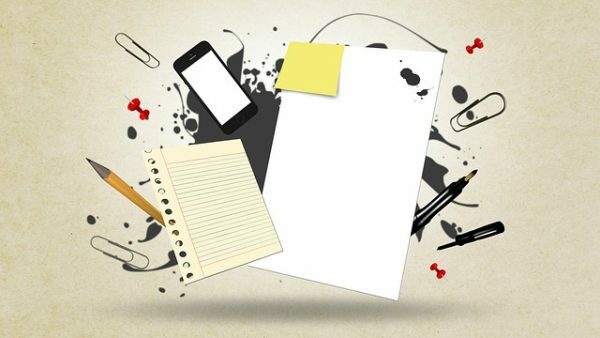 These tools can be used for both working and learning, so for example WordPress also functions well as a course site. Some of the open source tools have considerable developer communities that provide 3rd party plugins, which means that these tools can be built out into more significant platforms. (see D below for more on this). Other organisations have chosen proprietary tools to build their “social layer”, e.g by using Confluence to help teams create, share, manage and discover content, and Yammer or Socialcast for internal networking. This means it is very easy for users to create groups which can be used for collaborative working, for communities of practice or learning communities. Jane Bozarth explains the value of enterprise networking tools like Yammer within formal learning, here. Although once again these are stand-alone tools, the important fact is that they are being used for both working and learning. However, many of them do have connectors to other popular systems, like Sharepoint, so that they can be more fully integrated to build a social intranet. (see E below for more on this). Finally, many organisations who are not hamstrung by legacy systems, have chosen to install new enterprise social intranet software like SocialText, ThoughtFarmer or Podio. Since many of these organisations are thinking very differently about how work and learning happens in their organisations, they are often outsourcing all training, and focusing more on learning support and knowledge sharing, which can easily be powered by these collaboration platforms. So these are just 6 basic ways that organisations are integrating learning and working by using the same social tools. But what are some of the success criteria for achieving this successfully? That’ll be the subject of the next post in this series. Great, just that information i need to build ways to influence my company…. Wow, there are so many options and approaches out there. I find that my organization is using more than one of these approaches due to different technology owners and business needs throughout the organization. Do you find that this dilutes effectiveness by having different places where associates must go to collaborate? Naomi – yes, there are already many social tools – and as more and more dedicated learning tools add social functionality, we are going to end up with even more, which will mean lots of silos of information around the organisation which cannot be shared. Many thanks for the CourseDirector LMS mention!